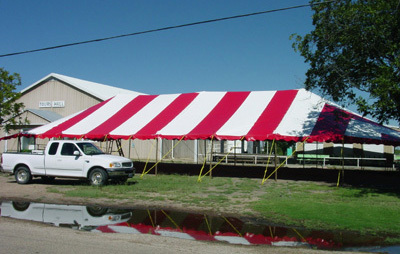 Ohenry Tents' party tent is ideal for large outdoor events and is built to endure multiple set ups and tear downs. Included are extremely durable and light weight side poles and each of the center and quarter poles have a plate welded to the top and bottom, and a heavy duty pin welded into the top. The top and sidewalls will arrive rolled up in a protective bag to prevent damage during transit. Tops are available in solid white and solid white with red, green, yellow, or blue vertical stripes.